We gave him some cat food and he seems to be enjoying it! I live in Kitchener, Ontario. I went out around 2 am to put the garbage out and almost had a heart attack!! I lifted the lid on the can to throw the bag in and to my surprise there was a possum inside! I screamed and ran away because I didn't know what it was and I surely wasn't expecting to see that. I went and got my husband who came outside to check it out. The possum looked scared and he wasn't moving much. It was pretty cold out and had just started snowing so I think maybe he was trying to keep warm. I have no idea how it got inside the garbage can with the lid on though. It had to had been inside if it all day. We tried to tip the can on its side so it would go but it just stayed there. So we just left it and will go check in the morning to see if it has left. 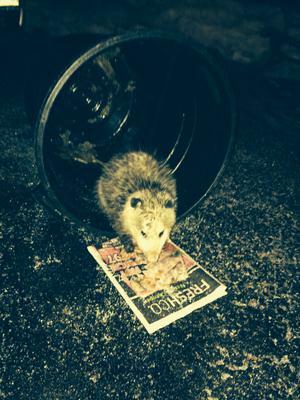 We also caught what I think is the same possum a few days ago in our backyard, but when we went outside it ran away. Seems like he really likes our place! Comments for Dirty garbage possum!